Emily graduated from Reed College in 2001 with a BA in biochemistry and molecular biology. She moved to the midwest in 2002 to pursue a PhD in chemistry at the University of Wisconsin–Madison with Laura L. Kiessling. There she worked on developing inhibitors to UDP-galactopyranose mutase, an essential enzyme in the synthesis of the arabinogalactan portion of mycobacterial cell wall, verifying it as a therapeutic target to treat tuberculosis. After graduation in 2008, she switched fields and began an American Cancer Society postdoctoral fellowship with Gerald Crabtree at Stanford University, where she worked to develop inhibitors of the BAF (SWI/SNF-like) chromatin remodeling complex. In addition, she started defining the mechanisms of BAF-mediated tumor suppression, and uncovered a novel role for BAF complexes in decatenation of DNA by topoisomerase IIa. She started her independent career at Purdue University in the Department of Medicinal Chemistry in 2013, where her lab continues to unravel roles for chromatin regulation in cancer, as well as develop therapies to target epigenetic processes. Shelley Woloshuk is the Lab Manager for the Dykhuizen research group. She is responsible for organizing and maintaining supplies, overseeing regulatory and safety requirements along with other research duties. ​Chad obtained his BS in chemistry from Northern Kentucky University in 2013 where he did organometallic synthesis with Keith A. Walters. He then moved to New England to pursue a PhD at the University of Connecticut with Kyle Hadden in Pharmaceutical Science with a concentration in Medicinal and Natural Product Chemistry. His doctoral work focused on the design and synthesis of sterol-like small molecules targeting the Hedgehog signaling pathway. These small molecules were evaluated in cellular assays for anti-cancer potential and to identify and characterize their novel cellular targets. 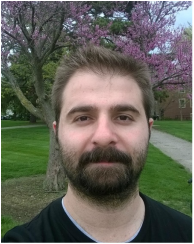 With an interest in epigenetics and cancer, Chad joined the Dykhuizen lab in February 2018 to begin his postdoctoral career. Elizabeth (Libby) Porter grew up in the Detroit area. She earned her Bachelor’s degree in Biochemistry from Calvin College in Grand Rapids Michigan. She is currently a graduate student in the PULSe program. Libby joined Professor Dykhuizen’s lab in May of 2014. Her project focuses on elucidating the mechanism by which Polybromo targets the P-BAF complex to specific regions of DNA, to identify new drug targets for cancer treatments. Aktan was born and grew up in Ankara, the capital of Turkey. He graduated from Middle East Technical University (METU) with a BSc degree from Department of Molecular Biology and Genetics in 2011 and an MSc degree from the Biology Program in 2014. In August 2014, he started at Purdue University as a PhD student in the PULSe program. He joined the Dykhuizen Lab in August 2015 and is currently working on potential targeting mechanisms of polycomb repressor complex 1 (PRC1). Sijie is from Shanghai, China. He earned his Bachelor’s degree in pharmaceutical engineering from East China University of Science and Technology in 2014, and a Master degree in chemical engineering from University of Southern California in May 2016. He joined Dykhuizen lab in December 2016. He is currently focusing on the targeting mechanism of Cbx7/8 proteins, as well as screening for potential ligands of Cbx7/8 via DNA encoded chemical library.